Receive your statements faster each month. Save time and rest easy by controlling the cards in your wallet with the phone in your pocket. This dinner will help support high school seniors at Milan, Jac-Cen-Del, East Central, Batesville and South Ripley to further their education, as this was Nancy's passion. 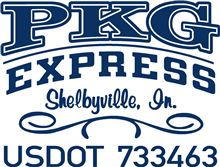 PKG Express started in 1998 with one truck.